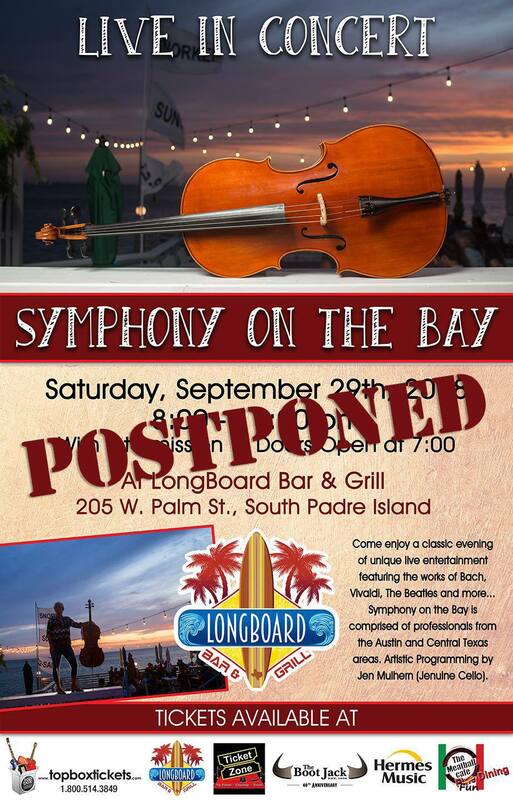 We are unfortunately POSTPONING this Saturday’s September 29, 2018 Symphony on the Bay at LongBoard Bar And Grill due to high chances of rain. We are sorry for any inconvenience, but the good news is we’ve set a new date: Saturday, November 10th! As you know, LongBoard is an outdoor only venue. The magic of our live event relies on clear skies for the sake of both our audience and musicians. Forecasts are difficult to predict, but for the sake of our artists and their instruments we’ve decided not to risk it. No worries though-our postponed date of November 10th will happen RAIN OR SHINE…the show must go on! Live in Concert! 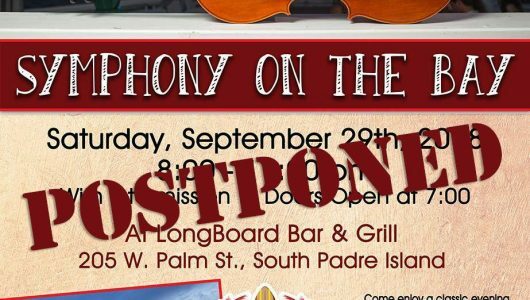 LongBoard Bar & Grill presents Symphony on the Bay, an 8-piece String Orchestra of talented young professionals from the Austin area performing one night only on South Padre Island! While enjoying the music and bayside views, audience members will have access to table service featuring food and beverages from a Special Menu by Meatball Cafe/LongBoard B & G (not included in Symphony on the Bay ticket price). General Admission seating is on a ‘first-come, first-served’ basis. Doors open at 7:00PM; performance lasts from 8:00-11:00PM with a 25-min intermission. All ages welcome, but please respect the listening environment by helping us keep crowd noise to a minimum during the performance.